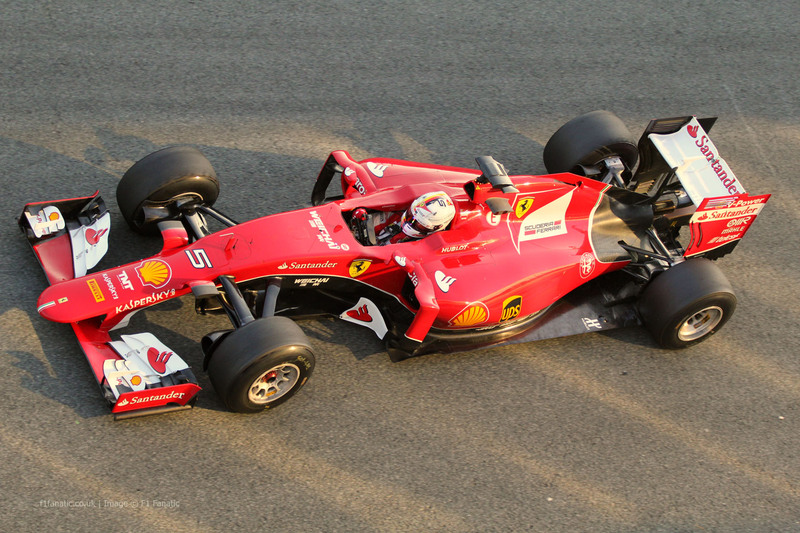 Sebastian Vettel has finished as the fastest driver in the 2nd pre-season test for the 2015 Formula One world championship at the Jerez circuit in Spain. The new Ferrari driver set his fastest lap of 1’20.984, the fastest time of the test so far, before the lunch-break and before eventual showers would grace the circuit; confining some to their garages. The German has kicked off his career as a Ferrari Formula One driver excellently after completing 149 laps over the course of his two days in the SF15-T.
Second fastest for the second day in a row was the Sauber team, this time with rookie Felipe Nasr. The young Brazilian completed 88 laps of the circuit and, like fellow rookie Verstappen, seemed unperturbed when the rain fell in the afternoon; instead choosing to continue putting in laps. After a slow start yesterday, Williams were out on track within the first 5 minutes with Valtteri Bottas behind the wheel for the last time until the Catalunya test. The Finn set the 3rd fastest time, half a second slower than Nasr, with 61 laps on the board. Reigning champion Lewis Hamilton made his first official testing run in the Mercedes W06 today after watching team-mate and 2014 title rival Nico Rosberg take to the track yesterday. The Briton was unable to match Rosberg’s incredible 157 lap total, but he did lap fastest than his team-mate by 7 tenths of a second; not that it matters during pre-season testing when times are very much irrelevant in terms of who is the quickest team or driver. Lewis completed 91 laps, the most of anyone during the day, before the team elected to end the day early thanks to a water leak. Max Verstappen took over the cockpit of the Toro Rosso from fellow rookie and team-mate Carlos Sainz for today. The 17 year old completed 73 tours of the circuit on his way to setting the 5th fastest time. Toro Rosso have had a good first 2 days of testing with a total of 119 laps so far with two days to go. After missing out on a scheduled day of running yesterday, Lotus finally made their on-track début with their E23 car. Pastor Maldonado, who was set to run yesterday but was prevented from doing so due to the car still being in transit to the circuit, took to the track around an hour into the session for a number of short installation laps. He would go on to set a best time of 1’25.802 after 41 laps; a great effort considering it was their delayed first day of testing. Like Button, Daniil Kvyat completed a number of installation laps, 18 in fact, but failed to put a timed lap on the board. 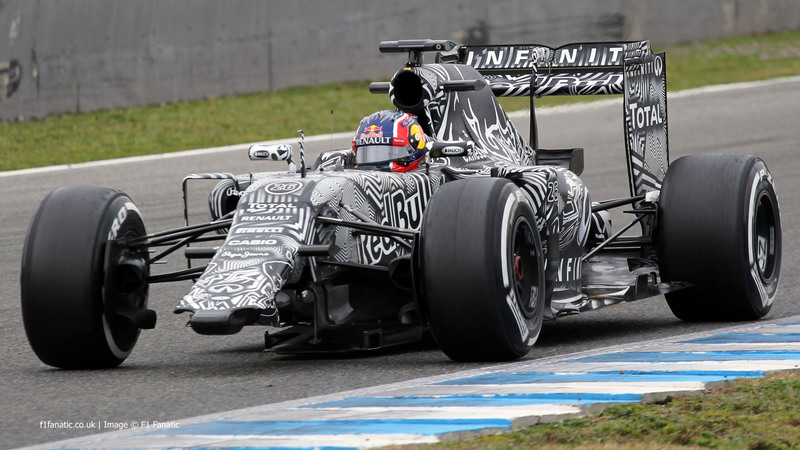 The Russian was making his début as a Red Bull driver in the camouflaged RB11 when he appeared to break the front wing. This was the only front wing the team had brought to the test, meaning that for the rest of the day the car was out on track with just the nose on the front of the car; ironic for a team who purport to ‘give you wings’. Testing continues tomorrow with the penultimate day of running at the Jerez circuit. Mercedes,Williams, Red Bull, Ferrari, Toro Rosso, Lotus and McLaren are set to switch their drivers over, with Felipe Massa, Kimi Raikkonen and Romain Grosjean making their first on-track appearances in their 2015 cars.